An incredible road map of the Universe showing the pathways between our Milky Way and 100,000 other far away galaxies has been revealed by scientists after a 10-year quest into the unknown. The gigantic supercluster of stars, planets and asteroids, which stretches 500 million light years across and has the mass of a hundred quadrillion suns, has been named Laniakea – Hawaiian for ‘immeasurable heaven’. The astonishing discovery has revealed that the Milky Way – home to Earth and our solar system – is on the fringes of the enormous cosmic web. The vast road map may look as though it is densely packed, however there are vast expanses of darkness where nothing can be found for hundreds of light years. Our supercluster is the first to be mapped and shows galaxies strung out along glowing pathways that are held together by gravity as the groups make their way through space. Scientists have long-known that galaxies are not distributed randomly but congregate together in clusters. When these clusters meet in the cosmos, they create giant superclusters, like Laniakea. To put the sheer size of the supercluster into context, the Earth is the third planet from our Sun, which is one of just billions of stars within the Milky Way. Other than being our home, our galaxy is nothing special and is one of around 100,000 within our supercluster. And even though the collection of bright galaxies is incomprehensibly large, it makes up just a corner of the observable Universe. 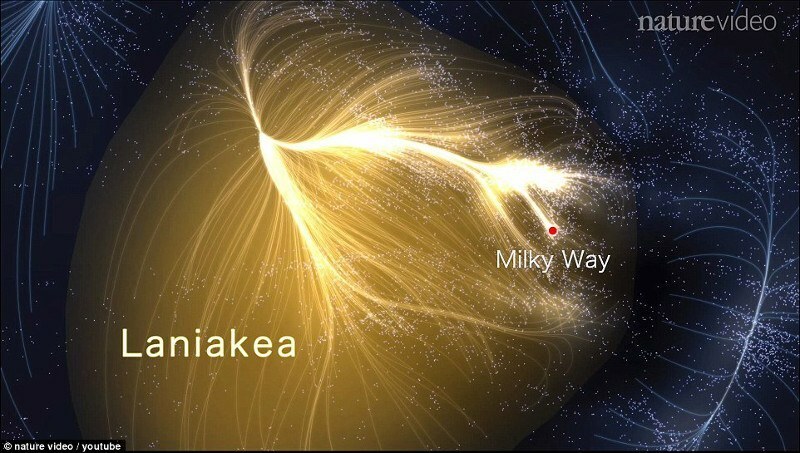 Within Laniakea, galaxies flow inwards towards a region called the Great Attractor, the equivalent of a large gravitational valley. Around our supercluster are four others – known as Shapley, Hercules, Coma and Perseus-Pisces – however it is difficult to show exactly where our neighbourhood of galaxies ends and the others begin. Dr Brent Tully, from the University of Hawaii in Honolulu, led the team of scientists that mapped Laniakea’s boundaries from measurements of the velocities of local galaxies. The researchers compared the galactic movement with that of water in a landscape of hills and valleys, tracing the outer surface of a region where the net-motion of galaxies was inward. Wait…was that a Storm Trooper?